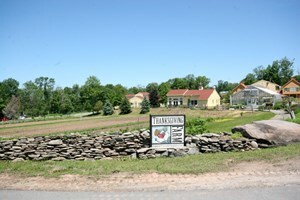 Thanksgiving Farm is part of a large-scale care facility, The Center for Discovery. The clients, whom we call “the guests,” are either individuals with multiple disabilities or individuals on the autism spectrum disorder. Educational, residential, clinical and adult programs are offered to both children and adults. Some of the core values aimed at have to do with wellness, high quality food and sustainability. Also a high priority of the programs is to have the guests being active outdoors, which includes their participation in farming. To add to that, the farm has a CSA program with about 250 shares for staff and people of the local community. This gives the farm 2 goals: a consistent production of high quality product to cover as much of our food and nutrition needs as possible and the integration of the guests in specific parts of the farm operation, like flat seeding, post harvest preparation, egg collecting and processing, herb growing, harvesting and processing to name a few. These goals and the great variety of crops and livestock give a unique character to the farm. We practice biodynamics; this has been since the beginning of the farm (21 years ago) but it has been penetrated more in depth in the last 9 years. We are Demeter certified since 2008. We make all the biodynamic preparations, and we make compost with all the manure. We are gradually getting hold of the balance crops and livestock (which is challenged by the demand for produce and the insufficiency of good cropland), and working at developing our understanding of the farm organism. Apprenticeship Details: This 2014 season starting in April, we will begin with 2 apprentices that would join our healing gardens (medicinal and culinary plants). Beginning in winter 2014-15, we will likely seek apprentices to be part of the livestock or the extended season vegetable growing. Eventually there will be a place for 1 or 2 apprentices on each of the 3 teams (livestock, vegetable, herbs) joining that particular group of farmers (between 3 to 7 individuals) for the growing season and/or for the winter phase (only livestock and vegetable). They will work along side the farmers of the team. In our system the apprentice is to be an employee with housing benefit. The housing offered has all the basics and comfort one can expect. Two apprentices may be asked to share space. Beside the working hours the apprentice is on her/his own. Some of the other farmers live on the premises and are basically the only employees to do so. The apprentices are required to work the same hours as those on the team they join, which can be 10 to 12 hours a day, 5 to 6 days a week in the full swing of the season. The compensation will be something equivalent to the minimum wage, still to be determined.